Ashwini Kulkarni belongs to the Civil Society organisation Pragati Abhiyan based in Nashik. 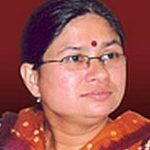 She has been associated with rural poverty related programmes for two decades. Pragati Abhiyan works with tribal villages of Nashik district and is also involved in research and policy work.